In addition serving as a Senior Vice President at Colliers International’s Houston Office, Coy Davidson is also one of the first members of the commercial real estate industry to recognize the branding power offered by industry-specific blogs. He created The Tenant Advisor in 2009 and has subsequently grown it into one of the most popular resources for commercial real estate-related content on the Internet. 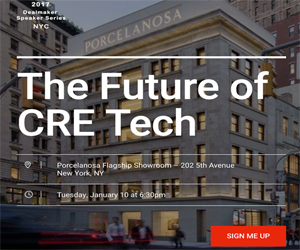 He is also a member of the CRE App Advisory Board and was kind enough to share some of his opinions regarding CRE tech for this Q&A. Coy: To me the most exciting trend is that these new services are bringing new efficiency to the process of selling or leasing commercial real estate, whether it is marketing property or managing transactions, and they are allowing us to provide a higher level of service to our clients. A lot of people talk about disruption, but that’s hogwash. How we fundamentally transact real estate is still the same, and it’s a complex process with multiple participants and disciplines. What these new products and services are bringing to the table is new efficiency to the process by allowing multiple stakeholders to collaborate in the cloud and in real-time. Coy: It is not uncommon for many of the CRE tech start-ups to reach out to me directly, but also following the right people on social media and attending CRE tech events helps. Coy: I use Apto for a CRM, Visual Lease for client lease administration, LeaseMatrix for lease analysis, TenEight for property tours and CompStak for market intelligence. Oh yeah, I still use CoStar everyday. I am super interested in what Hightower and RealMassive are offering. 4. What’s the one area of CRE Tech you wish you had a great product for? Coy: A product that fundamentally changes the way CRE brokers market properties to each other on a daily basis. My biggest pet peeve is receiving hundreds of emails that clog my inbox daily that are either in the form of an out of the box e-mail marketing program, or a PDF flyer. We are spamming each other to death. I long for the day email is no longer used a primary property-marketing tool. Coy: If you don’t use it lose it! There are lots of shiny new tools, but if it doesn’t make you more efficient or help you deliver a higher level of service, then you are wasting your money or time on the service. Every broker needs a quality CRM, start there!